The central upland part of Cumbria known as the Lake District is a popular tourist area and has been a National Park since 1961. In many of the valleys mining along with quarrying and farming has been an integral part of the local economy for centuries and helped to form the landscape that we know today. Geographically the mines fall into three areas, the following list describes mines of mineralogical interest. The Coniston mines were large in terms of commercial output and have a fascinating history but generally worked massive sulfide ore with little in the way of oxidation zones. Groups of small transparent quartz crystals were found here. Force Crag vein, courses E-W and has been worked extensively at the head of Coledale valley above Braithwaite. The upper levels yielded barytes and psilomelane but were not commercially viable until the 1860’s when barytes became a saleable product, whilst the lower levels produced sphalerite and a little galena. 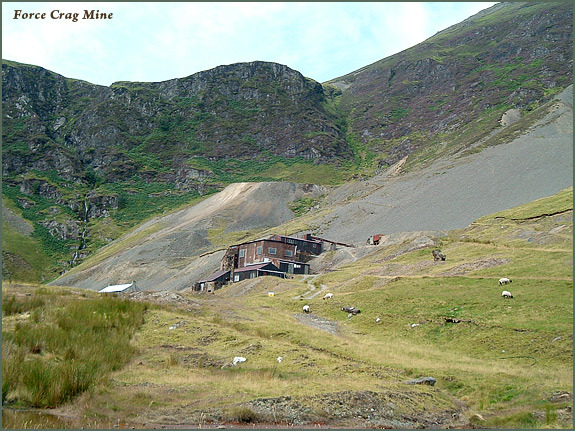 Intermittent mining has taken place since the early 18th century and on into the 20th century, the last workings being carried out by The New Coledale Mining Company from 1984 to the early 1990’s when many fine specimens were found. A surprise discovery in the 1990’s on the 650 level off the Laporte incline produced a suite of supergene minerals:- acanthite, anglesite, well crystallised cerussite, langite, lautenthalite, linarite, serpierite, native silver and extremely fine pyromorphite crystals to 2cms of a pink to brown colour. For a fuller description see UK Journal of Mines & Minerals - Issue No.18. 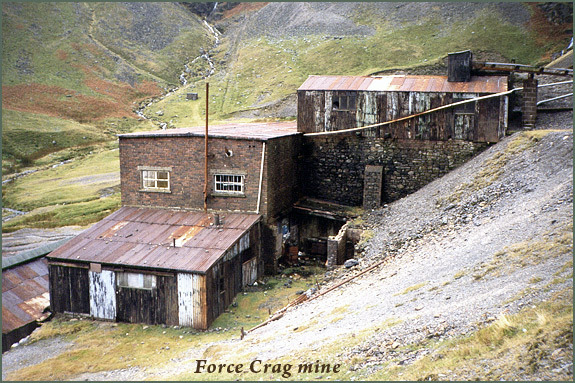 Other minerals found at Force Crag include lustrous sphalerite and galena often on dolomite, yellow fluorite and large barite crystal groups to 30cms. Old references to stolzite have not been proven. The mine is now listed as an SSSI. 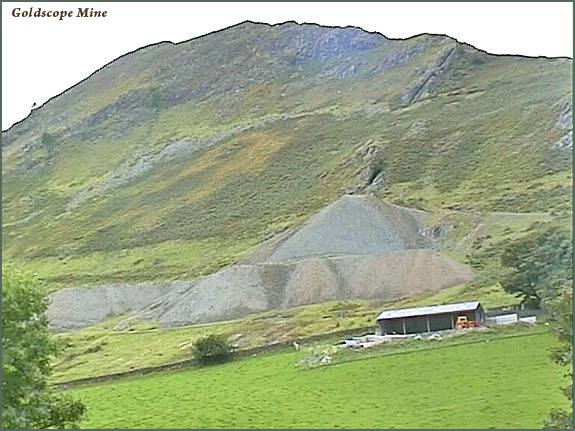 Brundholme mine and Blencathra mine worked two lead / copper veins on a small scale. Cerussite, chalcopyrite, pyromorphite, chrysocolla, barytes and galena are reported from here. To the north, just off the map near Bassenthwaite village a small deposit of antimony was worked from which occasionally small specimens of stibnite and stibiconite in quartz come onto the market. 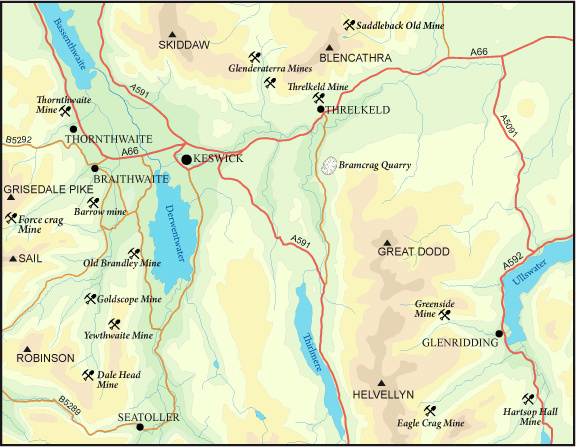 The Thornthwaite sett lies between Braithwaite and Thornthwaite village, with Ladstock, Rachel Wood, Thornthwaite and Beckstones Mines working the four principal lead / zinc veins. Mining is believed to date from the 18th Century, and like many others had a history of intermittent working through the 19th century. It was unusual however in that it survived the low metal prices in the 1870’s and 1880’s and during the period 1900-1920 was continuously worked. The veins contained galena, sphalerite, pyrite (well crystallised small groups), with dolomite, quartz and cerussite in the upper levels. Two lead / zinc veins, Woodend and Gategill were worked above Threlkeld village, the workings on Gategill vein being thought to pre-date the use of gunpowder. The mines are quite extensive, Woodend High and Low levels driven for nearly a mile beneath Blencathra. Quartz was the chief gangue mineral and pyrite was found in the lower levels which caused problems with ore separation and rotting of iron ventilation pipes. Barytes occurred in just one stringer off the Woodend Lode and chalcopyrite did not occur in economic quantities. Cerussite and malachite are also reported from here. Easily seen from the Keswick area with its extensive screes sweeping down the full length of the hill. Barrow is an old lead mine intermittently worked from the 17th century until its final closure in 1888. It is thought the main lode worked here was the continuation of that worked at Yewthwaite mine. The main gangue mineral is friable quartz. Supergene minerals are quite common, the spoil heaps producing ‘jack-straw’ cerussites to 3cms and green pyromorphite crystals to 3 or 4mm. Galena, sphalerite, pyrite and hydrozincite are also reported. The Seathwaite area is famous for its graphite mines which have been worked since the 16th Century until their final closure in 1891. The graphite found here is of the best quality, its occurrence being unique in the UK and it is one of only two graphite vein deposits hosted by volcanic rocks worldwide. Locally it was given the names ‘wad’ or ‘black lead’. Originally the graphite was used to mark the fleeces of the many sheep that roamed the Lake district hills. By the 17th century it was found to be ideal for lining the casting moulds used to produce cannon and musket balls and its value soared such that smuggling of illegal Wad became a problem at the mines. Other cheaper substitutes eventually replaced high quality wad in casting but it found a new use in pencils. Little now remains of the mines. Goldscope worked, by Lake District standards, quite rich copper and lead veins such that in the 1560’s it was called ‘Gottesgab’ (God’s Gift) by the German miners and its English name is thought to be a corruption of this rather than any reference to gold. The workings are very extensive and even after being worked on and off for many centuries, the ‘Great Lead Bunch’ was found in 1854 at the junction of the Copper vein and the Goldscope lead vein which for the following 12 years made for a very prosperous mine. The dumps have yielded chalcopyrite, anglesite and cerussite crystals, chrysocolla, pyromorphite, and linarite. A lead mine with extensive dumps occupy a small Amphitheatre between Catbells and Maiden Moor. It is likely that mining began in the late 18th century, and subsequently it was actively worked during the years 1849-1853 and 1863-1870, finally closing in 1893. Cerussite and a little pyromorphite are reported from the upper levels with galena, blende and quartz from the main workings. Anglesite has been found on the spoil heaps although I have found them to be rather barren. Intriguingly a copper vein is reported to cross the main Yewthwaite lode and has been tried at Little Mine Crag. A number of veins cross the upper Newlands valley and the eastern face of Dalehead. ‘St Thomas’s Work’ and ‘Long Work’ were started by the German miners in Elizabethan times. Its interest for collectors is that the orebody consisted of malachite and chrysocolla with chalcopyrite, chalcocite and pyrite. Certainly, even in recent years, malachite was readily found on the screes below Dalehead and occasionally brochantite. Pyrrhotite is also reported. Castle Nook mine worked two lead veins but on a very small scale. An old lead mine in the upper reaches of the Grisedale valley which worked the Eagle Crag and Clay veins from a number of levels some of these showing evidence of being worked with hand tools. It has been scheduled as an Ancient Monument. Although nine levels can be traced it was never a successful mine being overshadowed by the nearby Greenside mine. Eagle Crag has been the source of some excellent secondary minerals including blue to white botryoidal hemimorphite, aurichalcite, hydrozincite, rosasite, dull tetrahedrite crystals to 15mm, small wulfenite crystals and both azurite and linarite. By far the largest mine in the Lake District, producing in excess of 2 million tonnes of lead ore from near continuous working over 200 years until its closure through exhaustion of the ore-body in 1962. Specimens do turn up on the market but not in great quantities and almost always of primary minerals. Those of special note include attractive groups of galena and calcite crystals, and small but fine galena and chalcopyrite crystals on micro-crystalline quartz collected by Sir Arthur Russell from the 150 ftm. level. Calcite in many habits including scalenohedral and nail-head forms, an excellent example of the latter can be seen in Keswick museum. Barite occurred in the upper levels in coxscomb groups and cerussite, witherite and pyrite have been reported. Another old lead mine, its mineralogical interest being the occurrence of small yellow fluorite crystals, one of the few locations that fluorite is found in the Borrowdale volcanics.